The Environment of Quality. The Quality Approach: Concepts and Definitions. The History of Quality. The ISO 9000 Family of Quality Management Systems. Safety of the Food Chain and the ISO 22000 Family. Quality Management in Laboratories: ISO 17025. Key ISO Management Systems. Total Quality: Personalities that Stand Out. 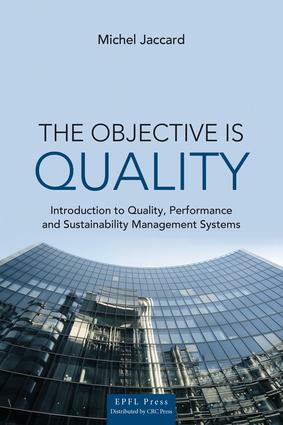 Total Quality Management: Prices. The Toyota Way and the Toyota Production System (TPS). Quality Control and the Six-Sigma Approach. Moral and Ethical Elements. Deontology of Professions and Functions. Environmental Management and the ISO 14000 Family. Social Responsibility of Organizations and ISO 26000. Michel Jaccard is a physicist (Ph.D. in biophysics from the University of Lausanne) who has worked as R&D project leader at Nestle and as a member of the direction of a large food corporation before joining the direction of the Ecole polytechnique federale de Lausanne (EPFL) in 1995. In this role, he has been director of academic affairs of EPFL; head of communications for the Board of Polytechnic Institutes (Zurich); and head of quality at the EPFL. In 2009, he was named director of International Affairs and Accreditation of the EPFL, and he is also Senior lecturer at the EPFL College of Management.